Feel thrown back in time when bellbottoms and peace signs were all the rage with this critically acclaimed tribute to Sonny and Cher. 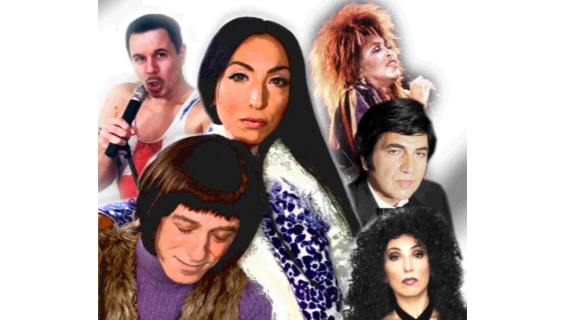 Kara Chandler and Marty Stelnick will amaze you with their authentic recreation of the Sonny and Cher comedy hour. Laugh along to hilarious sketch comedy and sing along to all the classic hits you remember including “I Got You Babe”, “Baby Don’t Go”, “All I Ever Need Is You” and many more. This high energy variety show will visually captivate you with stunning costume changes, classic television commercials, and special guest tribute performances to Freddy Mercury, Tina Turner and Engelbert Humperdinck. This one of a kind show has been wowing audiences worldwide, don’t miss your chance to take part in this spectacular event.